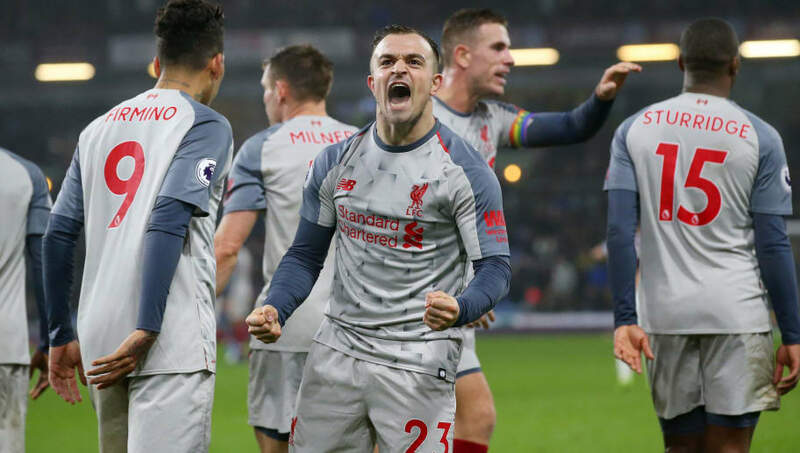 Liverpool moved within two points of leaders Manchester City, whilst extending their unbeaten Premier League season, after coming from behind to win 3-1 at Burnley. Jurgen Klopp made seven changes to the side that beat Everton on Sunday and elected to keep Mohamed Salah and Roberto Firmino on the away side's bench. After a fairly uninspiring first half for both teams, the Clarets went ahead ten minutes after the break through Cork, who bundled the ball into the back of the net following a kerfuffle in the six-yard box in which a host of ​Burnley players were battling to get the ball past keeper Alisson. ​James Milner grabbed the equalising goal after 60 minutes with his low drive finding the bottom right corner of ​Joe Hart's goal. With just over 20 minutes to play, Klopp brought on ​Mohamed Salah and ​Roberto Firmino and it proved to be an inspired change. Firmino took just three minutes to put Liverpool into the lead. The points were then wrapped up for Liverpool through Shaqiri's late strike earning a well deserved victory for Klopp's men. Burnley could have been two goals to the good before ​Liverpool even got on the scoresheet. Ashley Barne's sublime left footed volley from a terrific ball from Robbie Brady hit the back of Alisson's net - only to be ruled out for offside. The chance was four minutes before the interval and could have meant the Clarets going into the break with a one goal lead, which may have changed the complexion of the game. Joe Hart kept his side in the game early on and produced some fine saves, as the on-loan keeper continues to enjoy his time in claret and blue. The Manchester City keeper produced a stunning save to keep the scores at 0-0. Keita's powerful drive was tipped onto the post with the fingertips of the former England number one. For Burnley, there were no standout poor performances and the 3-1 scoreline didn't reflect a decent effort from the Clarets. However, Chris Wood would be the man who could be given the award. The 26-year-old has just the solitary goal this season as Burnley are struggling for goals. The striker was missing for large portions of the game and with 20 minutes remaining, Sean Dyche replaced the New Zealander with Sam Vokes. Jurgen Klopp will no doubt be concerned with the injury sustained to defender Joe Gomez as the 21-year-old lasted just 20 minutes at Turf Moor. The youngster was caught by a heavy challenge from Ben Mee and then appeared to collide into the advertising hoardings. It wasn't a particularly wonderful night for any of the Liverpool team and no one really stood out as having excelled. Alexander-Arnold was positive and bright when he came on to replace the injured Joe Gomez, and van Dijk's superb assist for Firmino's goal capped a fine performance from the Dutchman. However it was Naby Keita in the middle of the park who was good throughout, and was unlucky to be denied a goal through a fine save from Joe Hart . Having made such an impact in the Merseyside derby, Klopp gave Divock Origi the chance to start ahead of Firmino and Salah. Unfortunately for the Belgian, it wasn't really his night and he never really threatened Joe Hart in the Burnley goal and generally looked out of place in the Liverpool 11. Burnley host ​Brighton at Turf Moor - a place they have seemingly struggled to win this season despite last season's heroics. Sean Dyche will need his men to start picking up points, particularly at home, or his time at Burnley may be running out. Liverpool, who have now made their best ever start to a season, take a trip to the south coast to face Eddie Howe's ​Bournemouth side who have been performing well of late.